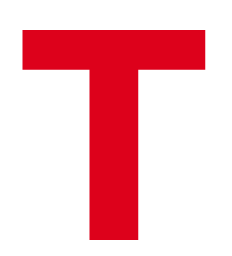 Tagging software for individuals and teams, Tabbles takes you beyond folders and drive letters. Tabbles unified search box can search through file name and paths, as well as tags, comments and file content. Tabbles unique Folder Synchronization feature, lets you tag files on any cloud storage or file synchronization tool, by yourself of with your team. See how to set it up. Tag Outlook emails and bookmarks on any browser, and find them along with your files inside your tags. Let Tabbles scrape your drive(s) using regular expressions to data-mine sensitive information (email addresses, credit cards or social security numbers) or names from a list and auto-tag files. Tag, auto-tag and share your tagging with your colleagues. 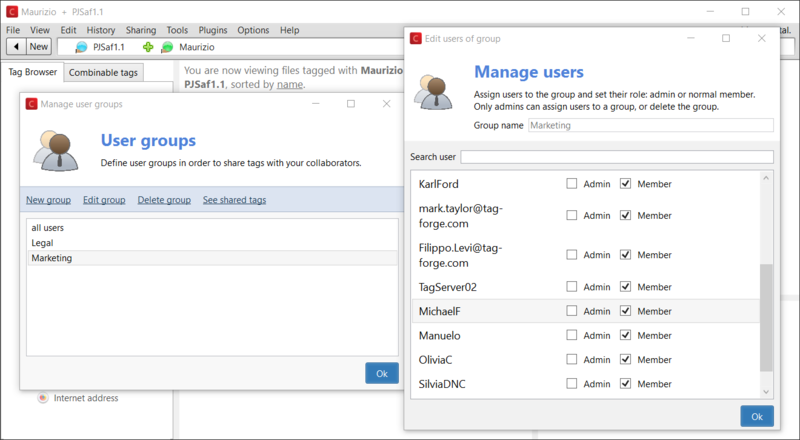 Tag on local disks, network drives and in the Cloud, manage users and groups through granular permissions. You can preview most graphic files (psd, ai, jpg, png…) and PDF (the first 10 pages) in the preview box of Tabbles. 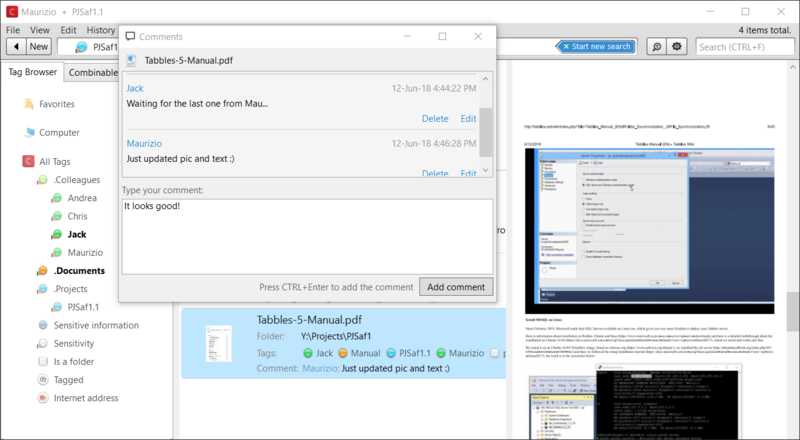 Tabbles is deeply integrated with Windows Explorer: you can perform many tasks from the Context Menu, and you will see an Overlay icon on tagged files. Tabbles can tag any file type and folder on your PC’s hard disk, for any file system that Windows can read. Tabbles works on USB disks and sticks as well: you can setup a Cloud account to have your tags synchronized across multiple devices. Use Tabbles to collaboratively share your tagging with your colleagues on your network drives and use chat-like file comments to communicate. It works on any file system. 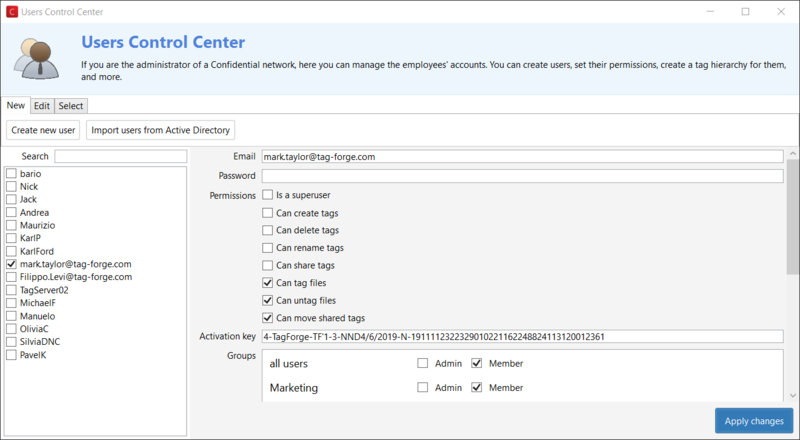 The auto-tagging rules work on shared folders as well and your SysAdmin can use Tabbles granular permissions to define what each user and can do and on what disk(s). 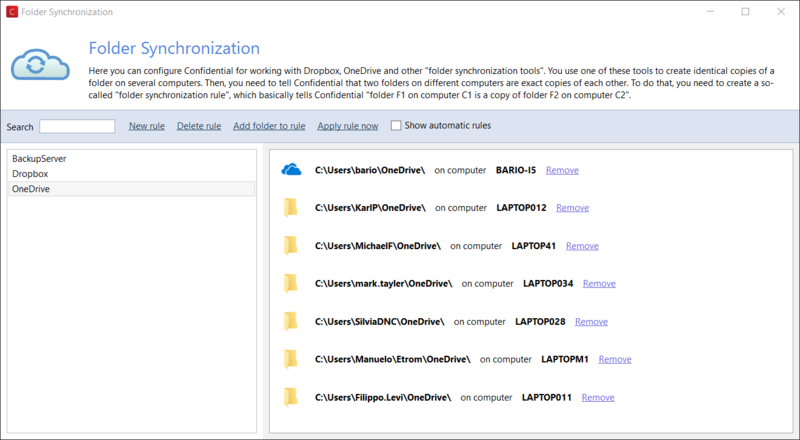 Using Tabbles unique Folder Synchronization feature, you can tag files on any cloud storage and file synchronization service. Using tag sharing and Folder Synchronization, you can tag files in your cloud folders along with your colleagues, wherever they are. See how to set it up. Tabbles collects in tags all your important files, bookmarks and Outlook emails in one place. Search by tag, comments, path and content in one search box. 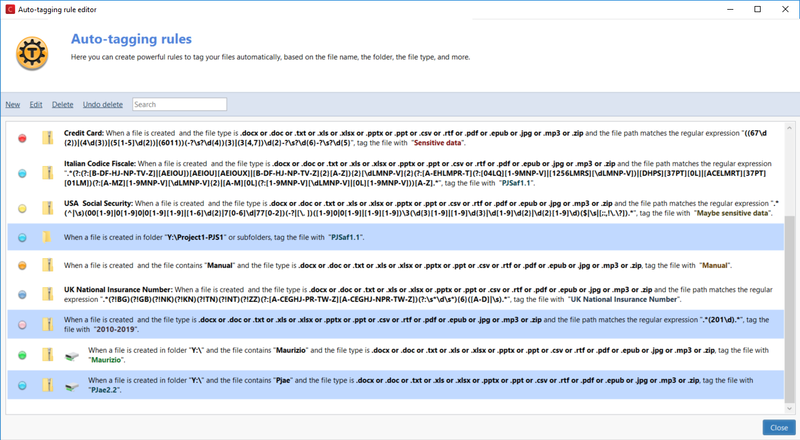 Let Tabbles automatically tag all your files based on powerful rules. Once you have setup the rules, Tabbles will listen to every new file you create (or save) and tag it accordingly. You can use Tabbles in Cloud mode, have it installed on 3 PCs and use your tagging from all of them. You can have your files tagged on Dropbox/OneDrive or on your NAS. 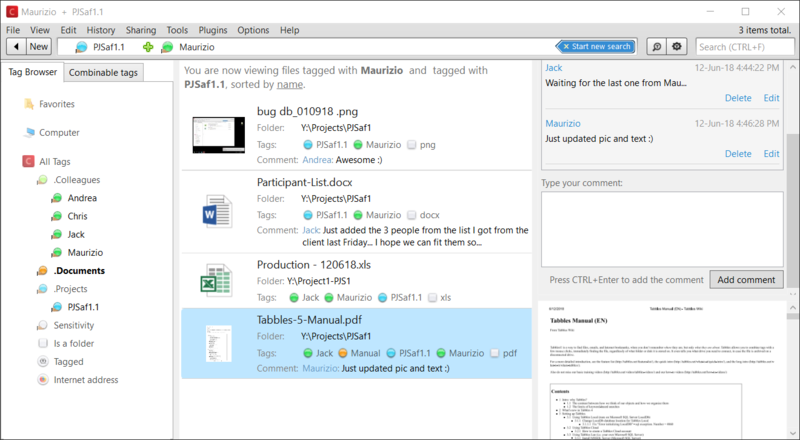 Use Tabbles to manage documents by sharing your tagging with your team and communicate using chat-like file comments, on local disks, network drives and in the Cloud. SQL Scripts allow you to monitor the database and export data. Tabbles granular groups and users management enables you map to assign different privileges to users and groups. 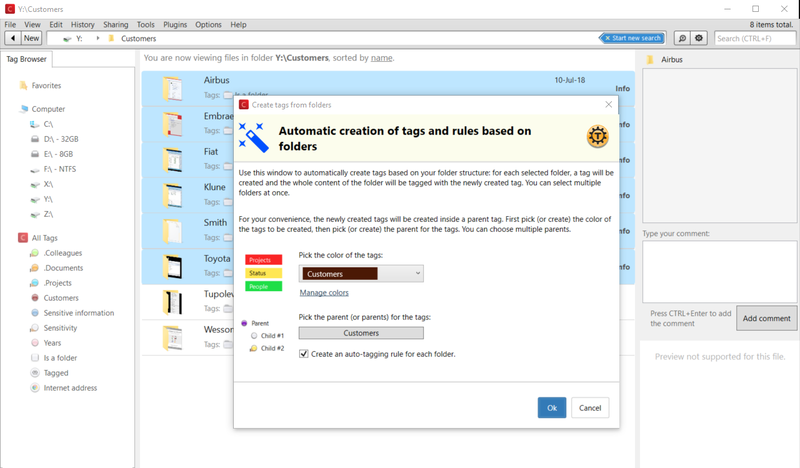 This enables you to create a tag-based hierarchy on top of the existing file system structure. Use Tabbles or Confidential as Data Loss Prevention tools by tagging (manually or through data-mining) your important data. Confidential adds tags visible in Explorer, enabling your team to spot sensitive files while browsing. The server is entirely contained in a MSSQL Database and the logic contained in stored-procedures: the server installation is fully automatic and maintenance is minimal. Tabbles is corporate class tool: it can be mass deployed in minutes via Group Policies, using its .msi installer and writing one standard file (containing the path to the database) in the users’ %appdata% folder. The User Control Panel of Tabbles includes a feature to batch-import users from Active Directory, along with managing granular privileges for users and groups. Tabbles offers a growing library of APIs, accessible in .net languages. 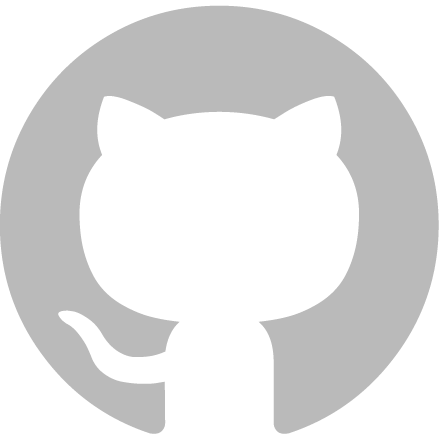 You’re welcome to ask us for help or request an API to develop your plugin! Create databases, export database, create rules, using XML files for max interoperability. Check our SQL scripts for sysadmins, to automatize functions like data monitoring, you’re welcome to contact us if you need more!